Elsa, our fearless tennis ball guardian dog. Livestock, what livestock? Don't contact her unless you have a ball to share. 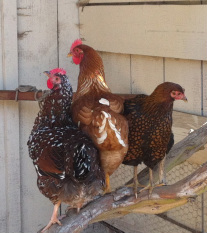 Three members of our mostly fearful flock of eight hens. We gave them all names of physically or creatively brave women to inspire them: Rosa, the partridge rock; Lucy, the gold comet; and Amelia, the speckled Sussex. You figure out the historic women! 2016 update: we recently added three young Black Australorps and 2 Cuckoo Marans to the flock--looking for more inspirational names (and ways to tell them apart!). 2017 UPDATE: A dead-of-night visit by an evil weasel left us sad and hen-less for a few weeks, but we have fortified the coop and introduced four new ladies who have been keeping us well stocked with eggs. 2018 UPDATE: Weasel strikes again! No hens make the move to the coast with us. We'll be introducing new pullets in the fall and potentially letting them roam with the yak.